September Slows written for the start of the Silkwood Trail. 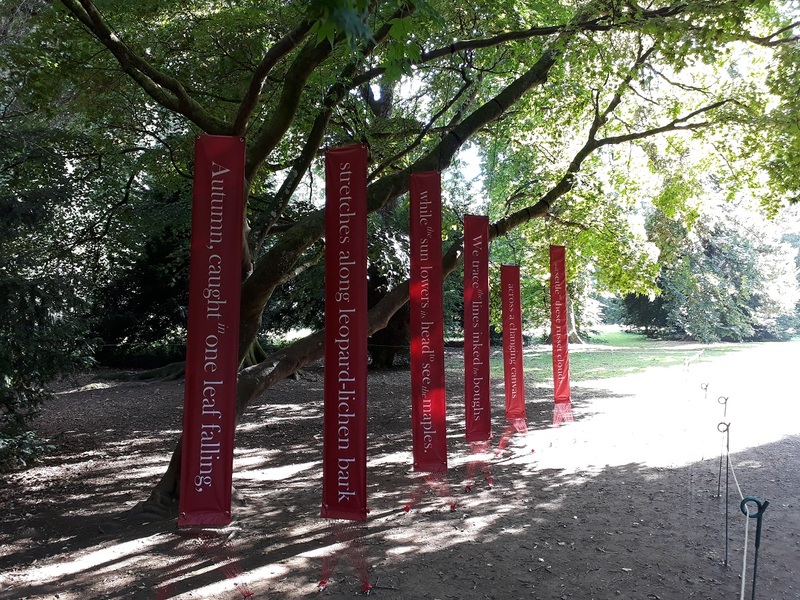 This is the first poem on the Westonbirt Arboretum Autumn Trail 2017.
while the sun lowers its head to see the maples. and settle among these russet clouds. My first poem appears on a Japanese maple at that the start of the Silk Wood Trail. To find out more about the Japanese maple please see the research section of the poem ‘Smoulder’. For many, Westonbirt means stillness; I wanted to capture the stillness created by trees. My poem originally began: “Stillness, sudden as autumn/ creeps along…” and I used images to evoke stillness. But, like TS Eliott, I see stillness as a dance: “So the darkness shall be light and the stillness the dancing” (T.S. Eliott). For me, poetry is all in the stillness, the holes where we place the words. However when I read the poem to my proof readers and tutors, although some of them loved “sudden as autumn”, others were perplexed; they did not see stillness as something that was “sudden” or that “crept”. I then changed the theme to autumn, but used ever slowing images to create a final stillness; from ‘stretches’, to ‘lowers’, to then ‘settle’ to give my poem ‘September Slows’. I wanted this to link to the final poem, its finishing line: “nurtures stillness, here for us to find”. "L(a leaf falls)oneliness" – EE Cummings, 95 Poems. “I’ll lie here and learn how, over their ground, trees make a long shadow and a light sound.” – Louise Bogan, Knowledge. “Remember your place among all living beings, embrace with joy the changing seasons.” – Ilan Shamir, Advice from a Tree. “Of all man’s works of art, a cathedral is greatest. A vast and majestic tree is greater than that.” – Henry Ward Beecher (quote). “I have reached illusion’s end in this grove of falling leaves. Each leaf a signal of past joy, drifting here within my heart.” – Mu Dan (quote). “Trees help you see slices of sky between branches … Trees help you watch the growing happen.” – Rochelle Mass, Waiting for a Message. “Hope is the thing with feathers that perches in the soul and sings the tune without the words and never stops at all.” – Emily Dickinson, Hope is the Thing with Feathers. “When will you learn, myself, to be a dying leaf on a living tree? … and at Autumn’s call wearing russet, ready to fall? … Shall not these branches in the end to wisdom and the truth ascend?” – Edna St Vincent Mallay, The Leaf and the Tree. “To realise the self is to be still.” – Ramana Maharshi (quote). “As the sun warms anything near, being warms everything still and the great still things that outlast us.” – Mark Nepo, In Muir Woods. “The trees know that you can be still and grow at the same time.” – Christopher McGeown, The Simple Truth About Stillness as Told by the Trees. “The trees in the garden rained flowers …” – Stephen Crane, The Trees in the Garden Rained Flowers. “The sun still hadn’t come up. The grass was still covered in its cool blanket.” – Mary Nagy, I Saw You Speak to the Trees. “There is nothing to save, now all is lost but a tiny core of stillness in the heart like the eye of a violet.” – D.H. Lawrence, Nothing to Save. “Season of mists and mellow fruitfulness, close bosom-friend of the maturing sun.” – John Keats, To Autumn. Leaf peeping: Each year over 100,000 visitors come to Westonbirt to enjoy the seasonal colour. And of all our trees, the Japanese maple (Acer palmatum) is the species most come to see. The first Japanese maples were planted in Silk Wood in 1877 by Sir George Holford, the son of the arboretum’s creator, Robert Holford. Today both the Japanese maple and full moon maple (Acer japonicum) seen here continue to play an essential role in the design of our Grade One picturesque landscape. A key aspect of this style is the concept of variety – amply demonstrated here in the changing colours of different specimen trees.